Link bait is an easy enough concept to understand: it’s about creating fantastic content (an article, blog, badges, widgets, pictures, etc) that everyone will love and link to. Link bait is not, however, that easy in practice. Right at the forefront of the problems you will encounter is volume. The net is packed full of people pushing out content that they think is brilliant and for every person contributing to the digital noise there are 10 000 trying to ignore it. Standing out amidst all that is always going to be difficult. You can get around it by narrowing down your target audience, which, as a marketer, you should be doing anyway. You’ll need to know their tastes, their needs, their questions and you’ll need to be able to answer them, or at least attract their attention long enough to lead them to your answers in a manner to which they can relate. You need to be able to judge your audience’s reaction correctly, but you also need to have a good idea and often this is the most difficult part of the process. Fortunately, there are tools available to help you when your creativity hits a brick wall. The following are courtesy of Piggy Bank Pie, the testing is all my own. Link Bait Generator is exactly what it says it is, but it’s not for the faint-hearted. Its approach is definitely quirky, so if you’re after an informational or serious angle you might want to try one of the other tools. Basically, you enter your phrase of choice in the little box and click Generate. If you don’t like what you get, or want several options you keep on clicking. I have a thing for blue cheese, it’s one of my favourite things, it’s also not what you would consider mainstream, and so I thought it would be perfect to test out the fabled Generator. It didn’t disappoint. Which, you have to admit is pretty unique. But more testing was in order. But it was the very first thing I got, so may the system was warming up. Next we have the Keyword Questions Tool, which provides far more general suggestions in the form of headings, but which can be adapted for several different approaches. 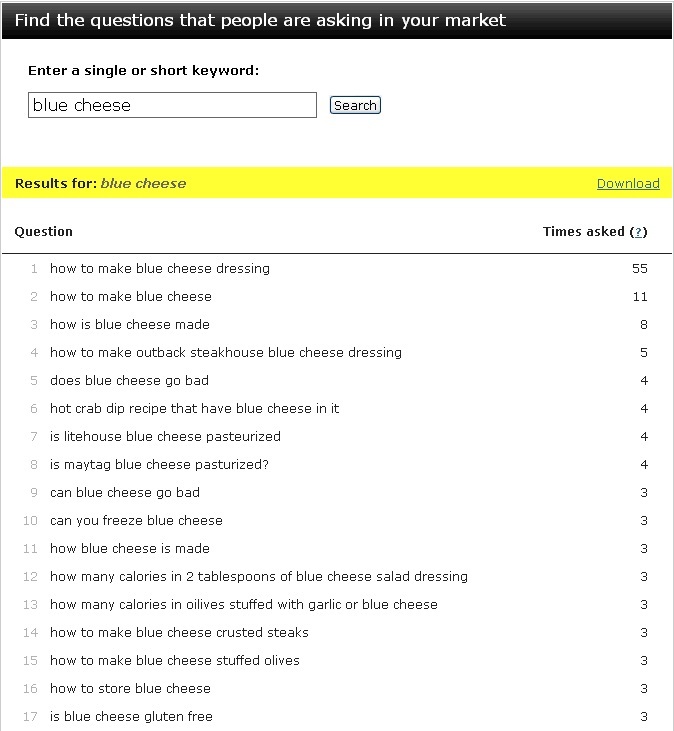 You type in a phrase (blue cheese) and it treats the phrase as a question and spits out a number of questions that people have already asked about the subject. It ranks the questions by the number of times they’ve been asked, so in my example below, the most pressing question is: How to make blue cheese dressing? Next, Piggy Bank Pie suggests you try Digg’s search tool. Now, I would be wary of Digg. It really only reflects the interests of a relatively small group of internet users and it doesn’t particularly appeal to general consumers, who may not even know what Digg is. But, it does a good job of kick-starting the creative juices. 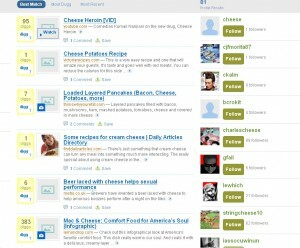 Sadly, my blue cheese search yielded nothing, so I had to go broader and do a search for cheese, and was rather surprised that the first thing to pop was a link to a cheese heroin video. I confess I didn’t watch it, but the idea is intriguing and it led to tangential thoughts about what makes cheese addictive and whether certain kinds of cheese are more addictive than others. It’s not exactly a creative peak, but you see what I mean about it serving as a good platform from which other ideas can spring. You can sort the results by best match, most dugg and most recent. I didn’t go beyond best match. Google suggest will also give you some ideas and if you’re really stuck you can trawl through Google Adwords, but my tool of choice is, without a doubt, Link Bait Generator; I’m very keen to find out how I can use blue cheese as a weapon.